Quick REMAP, according to Steve B. Reed who developed the REMAP process, is an excellent desensitization and exposure technique because it tends to work more quickly than traditional approaches. It is highly effective because it integrates the best of cognitive-behavioral, and psycho-sensory exposure methods with the use of client applied acupressure or sensory relief points. 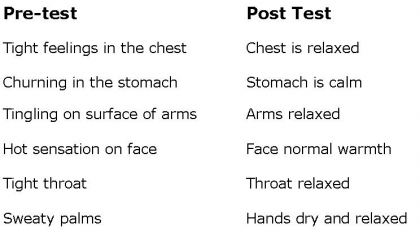 These points have been researched at some of the most prestigious universities and hospitals and have been shown to “…dramatically reduce stress and anxiety, alter the effects of blood flow to the mid-brain, calm frontal EEG activity, and results in improved scores on psychological indicators for anxiety and depression” (see attached references). It is well known that trauma experiences distort cognitive functioning (frontal cortex) so that logical thinking goes out the door. This is why talk therapy alone is not sufficient. To be more effective, one needs to access and neutralize (desensitize) the excessive emotional distress locked in the brain's alarm center (the amygdala). REMAP appears to do this by using evidence-based sensory or acupressure points that correct mind-body imbalances. The REMAP approach is similar to Wolpe’s systematic desensitization. They are both exposure techniques, and they both use “reciprocal inhibition” to neutralize the fight-flight response. Wolpe’s employs a psycho-sensory stimulation to produce relaxation, which tends to cancel out the tension associated with traumatic memories. This method works, but works very slowly. REMAP appears to work faster by accessing the emotional alarm center directly. Judith contacted me because she had heard that I used the REMAP method for dealing with the PTSD symptoms of trauma, and she had heard favorable reports about this method. Judith is a 67-year-old divorcee, semi-retired medical social worker. She reported having flashbacks, nightmares, and intrusive thoughts related to her work experiences. She was employed at a hospital in a major New England city. After 17 years at this job, she felt that she was suddenly and unfairly re-assigned and “discarded” by her Agency to a poor, urban community mental health center working with surveyors of trauma. She described this experience as “being sent to Siberia.” At this mental health center, she stated that she felt isolated from her friends and had experienced little support. She began to feel as if she was becoming “burnt-out” and she felt “rejected” from her previous position. These symptoms expanded into anxiety, depression, physical exhaustion, and secondary trauma/compassion fatigue related to her current employment. A year later she quit the mental health center job and moved back to Cleveland, Ohio to be closer to her family. In Cleveland, she took a part-time job as a social worker, but left within a year because the “burn-out signs became very evident.” She then received an invitation to explore a job at a Cleveland community mental health center. After she visited the center, she started to experience “flashbacks, nightmares, and intrusive thoughts about her last position in at a community mental health center in New England. Additional history revealed layers of past trauma. Judith had a very unhappy childhood, specifically insecure attachments with her mother. She felt that she always had to be a happy, obedient, and accommodating child. Conflict and negative emotions were not allowed to be experienced. As a young adult, she also recalled that her “critical and controlling mother” disapproved of her one and only boyfriend and indicated that he was “not suitable for her.” Furthermore, she was told that if the relationship did not work out, she should not return home. Judith subsequently married this boyfriend, and it ended up in a divorce. Judith learned that the best way to cope with on-going hostility was to become a super pleaser, and a humble obedient servant to authority figures. At the time of our session, Judith’s principal complaints were about her intrusive thoughts, nightmares and flashbacks. When I saw her, our principal goal was to decrease or eliminate the recently triggered PTSD symptoms that related to her past job re-assignment in New England. We used the Quick REMAP protocol as our principal treatment method. Because of the client’s limited income, we decided to conduct two sessions. The first session lasted 2.5 hours and included assessment testing, history, and treatment. The next session included a one-hour follow-up two months later. On this scale, 10 equals the worst possible distress and zero equals no distress at all. Judith was asked about the “worst part” of her ordeal. She immediately recalled the memory of being re-assigned (“discarded”) from the hospital setting and placed in a community mental health center. Her initial SUDS scale was 10 (high distress) regarding this particular memory. Following treatment and at the conclusion of the first session, when she was asked to re-activate this same memory, Judith’s distress scale dropped from a base line of 10 to a 0. She reported great relief. The IES is a very accurate tool for assessing the impact of traumatic events and other stressful life experiences. Studies have found the IES to be more accurate than the trauma scale included in the MMPI and also reliable for predicting PTSD with an optimal cutoff of 33 on the Revised Version (22 questions). A lower cutoff score of 24 was found to identify partial PTSD symptoms. Judith’s pre-test was a 30; slightly under the cutoff score for a clear diagnosis of PTSD but high enough for her to have PTSD symptoms. Following treatment and at the conclusion of the first session, her score was 0. At the follow-up session two months later, her score was only 5 indicating no significant PTSD symptoms. This was the subject’s major focus, i.e. to improve PTSD symptoms. This scale is a brief measure for assessing generalized anxiety and was developed by Dr. Robert Spitzer, M.D., et. al. Scores above 10 indicate generalized anxiety disorder. The STAI is the most widely used measure of anxiety in research. There are two versions of the inventory, the State that measures the present moment, and the Trait measures the person’s general tendency toward anxiety. A change of 8 points is clinically significant. On the pre-test for “State” anxiety (present intensity of anxiety at the present moment), Judith scored in the 97%ile. On the “Trait” factor that reflects frequency of feelings, she scored in the 93%ile. Post testing, two months later, showed improvement in both State and Trait anxiety. She scored in the 20%ile for State anxiety (present moment) and 83%ile for Trait anxiety. Although her Trait anxiety score was less, the change was not clinically significant. Her overall tendency for anxiety (Trait) is still high, but improved from pre-testing. Treatment with Quick REMAP successfully helped Judith to accomplish her therapy goal of eliminating her PTSD symptoms. She also resolved her generalized anxiety, Subjective Units of Distress and specific "State" anxiety relating to her distressful work experiences.